Q Will the LF Remap data be released all at once? LF Remap products will be released incrementally 2019-2020, by LF Geographic Areas (GeoAreas). More information is available on the LF Remap Delivery Schedule. Q What will be different with Vegetation for LF Remap? From a very high level there are minimal changes with Existing Vegetation Type (EVT). EVT for LF Remap uses Ecological Systems Classification System and was created using Landsat imagery, the LF LFRDB, as well as other geospatial inputs and classification trees. One of the more significant changes is with Existing Vegetation Height and Existing Vegetation Cover. Those products are now continuous data vs. binned into categories as before. For LF Remap's Biophysical Settings, Mean Fire Return Interval, Percent of Low-severity Fire, Percent of Mixed-severity Fire, Percent of Replacement-severity Fire, and Fire Regime Groups are now attributes of this product. A new product is the National Vegetation Classification which represents the current distribution of vegetation groups within the U.S. National Vegetation Classification circa 2016. Q What year will LF Remap represent? LF Remap's comprehensive vegetation and fuels mapping reflects circa 2016 ground conditions. As part LF Remap, disturbances on the landscape were mapped for the years 2015 and 2016. Q What are the imagery dates for LF Remap? LF Remap mapping efforts use 2013 - 2017 imagery. Priority was given to imagery from 2016. Q How is The Nature Conservancy (TNC) involved in LANDFIRE? Q What is the connection between LANDFIRE and Landsat satellite imagery? The Landsat program produces imagery that is the foundation for LANDFIRE's vegetation and disturbance data layers. The development of detailed vegetation maps are an essential component of LANDFIRE. Q How do I cite LANDFIRE data products? from www.landfire.gov Homepage title. (Last update). Available: URL [Access date]. LANDFIRE. (2013, January - last update). [Homepage of the LANDFIRE Project, U.S.
U.S. Department of Interior], [Online]. Available: http://www.landfire.gov/index.php [2013, February 8]. spatial data products Homepage title: Data product. Available: URL [Access date]. LANDFIRE: LANDFIRE Existing Vegetation Type layer. (2013, June - last update). U.S.
Department of Interior, Geological Survey. non-spatial data products Homepage title: Data Product. Q At what scale should LANDFIRE data be used? LANDFIRE products were designed to support national, regional, and sub-regional analysis activities. The native spatial resolution of LANDFIRE raster spatial products is 30-meters, however, the appropriate application scale is much larger than 30 meters, and will vary by a combination of product, location, and specific use. Users should refer to the metadata and local, regional or expert knowledge to determine if LANDFIRE products are appropriate for their application in their area. LANDFIRE products are not intended to replace local products, but serve as a rich supplemental data source with complete areal coverage, regardless of ownership. Q LANDFIRE data are in what projection? Q Can I change my data selection after I select my download? Yes. Refer to Modify Data Request Options for guidance. Q Why is my LANDFIRE (LF) data download (using the Data Distribution Site (DDS) or the LF Data Access Tool (LFDAT)) an empty zip file? If an error occurs during download, click here to retrieve the download bundle. Click on the here link inside the download file window to get your data. Q What types of data are needed for LANDFIRE updates? We need data that can be used to update LANDFIRE data layers, and data that could be used to remedy known concerns with previous versions. In a nutshell, we need Event data on any recent (current update cycle) disturbances or vegetation/fuel treatments that would have altered the composition or structure of vegetation and/or fuel. In addition to Event data, LANDFIRE also benefits from point or polygon vegetation or fuel plot data which may be incorporated in the LANDFIRE Reference Database (LFRDB). Q When do you need the data? LANDFIRE collects and welcomes submitted data on an annual basis throughout the year but has a data submission deadline of March 31 of each year. Data submitted before March 31 will be evaluated for inclusion into the appropriate LANDFIRE update cycle. Submissions after March 31 will be considered in subsequent updates. Q In what format do you need the data? We will accept Event data (disturbance and vegetation/fuel treatment data) in various formats, including ESRI shapefiles, geodatabases, and ArcInfo coverages. Supporting information, including definitions of the fields and any codes in the data tables, should accompany the data to ensure that they can be interpreted correctly. If you have LFRDB data (vegetation and/or fuel plot data) to share, we're even more flexible in terms of data format. We'll gladly accept digital data in, text files, spreadsheets, relational databases, ESRI shapefiles or geodatabases, and ArcInfo coverages - whichever is most convenient for the contributor. Coordinate information, including map datum, can be bundled with the other attribute information or in a separate, linked file, or data form. Supporting information, including definitions of the fields and any codes in the data tables or data-entry forms, should accompany the data to ensure that they are accurately represented in the LANDFIRE reference database. Q What is the purpose of LANDFIRE updates? An update program is vital to support the full spectrum of fire and natural resource management programs with timely and quality products that reflect recent changes in landscape conditions. The LANDFIRE updates focus on landscape changes to vegetation and fuels resulting from disturbance and treatment activities such as wildland fire, fuel and vegetation treatments, mortality from insects and disease, storm damage, invasive plants, and other natural or anthropogenic events. Areas of concern will be improved through the LANDFIRE update process, and the existing layers will be updated to reflect more current conditions. Q How do we submit data to LANDFIRE and who should we contact if we have questions? Q We have submitted similar information to a web-based data clearing house such as the NPS Data Store or an agency/corporate database system such as USFS-FACTS (Forest Service Activity Tracking System). Why don't you simply download the information you need from those existing websites or agency databases? 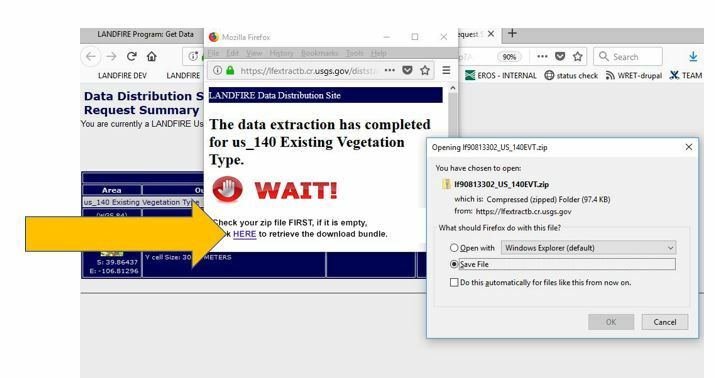 LANDFIRE does draw data from several web based data clearing houses including the NPS Data Store, USGS/NPS Vegetation Characterization Website, and USFS Regional Data Clearing houses. LANDFIRE also acquires data from agency/corporate database systems such as USFS FACTS (Forest Service Activity Tracking System) and USFS NRIS (Natural Resource Information System). The Website Agency DB Table provides a complete list of websites or agency database systems from which LANDFIRE draws data. For a copy of the Website Agency DB Table please visit http://www.landfire.gov/participate_refdata_sub.php. If you store data on one of the websites or agency databases listed in this table, please verify that a current version of your data are posted to ensure that this data will be evaluated for use in the next LANDFIRE update cycle. Q Why does LANDFIRE use VDDT? Beukema, S.J. ; Kurz, W. A.; Pinkham, C.B. ; Milosheva, K.; Frid, L. 2003. Vegetation Dynamics development tool, User.s Guide, Version 4.4c. Prepared by ESSA Technologies Ltd., Vancouver, BC. 239 p. [Online.] Available: www.essa.com/vddt. Keane, R.E. ; Parsons, R.; Hessburg, P. 2002. Estimating historical range and variation of landscape patch dynamics: limitations of the simulation approach. Ecological Modeling. 151: 29-49. The Vegetation Dynamics Development Tool (VDDT; Beukema and others 2003) is a public-domain, state-and-transition model that provides a framework for quantifying the rate and effects of succession and disturbance on a landscape. Users partition the landscape into states (for example, combinations of cover and structure) and define the transitions (for example, disturbances and succession) that cause movement between classes. For more information, please see www.essa.com/vddt. Q How is the accuracy of LANDFIRE vegetation data assessed? Learn more about Data Product Quality. Q What if we have an existing regional classification that we like better? Undoubtedly, there are regional classifications that are preferred over Ecological Systems for local applications. However, given the requirements of the national LANDFIRE Project, we must use a nationally available classification that will cover all land ownerships. LANDFIRE provides cross-walk information between LANDFIRE vegetation map units and existing map unit classifications whenever possible. Q What are the satellite imagery dates for the existing vegetation products? Q What are the LANDFIRE design criteria for developing vegetation map units? Identifiable - Vegetation map units must be able to be keyed from the LANDFIRE reference database, which is a field-referenced database made up of a compilation of existing government and non-government inventory databases. Additionally, all map units must adhere to standard federal terminology used in vegetation map unit classifications and descriptions of vegetation map units. Scalable - Vegetation map units must be hierarchical with regard to floristic and spatial scale. The aggregation and division of map units must be straightforward. The LANDFIRE map units must tier, where possible, to the physiognomic and floristic hierarchy detailed in the Federal Geographic Data Committee's (FGDC) Vegetation Classification Standard (FGDC 1997) and other documents describing national vegetation map unit classifications (Eyre 1980; Shiflet 1994; Grossman and others 1998; Comer and others 2003; Brohman and Bryant 2005). Mappable - Vegetation map units must be capable of being accurately portrayed geospatially as discrete entities and as attributes in geospatial databases. Field-referenced data used to develop training databases must have adequate vegetation information to distinguish vegetation map units. These map units must be congruent with approaches that integrate Landsat-based remote sensing and machine-learning techniques with biophysical gradient modeling for mapping vegetation across broad areas. Model-able - Vegetation map units must be logically consistent with the framework of the landscape fire succession models critical for simulating historical fire regimes and vegetation. Brohman, R.; Bryant, L. eds.2005. Existing vegetation classification and mapping technical guide. Gen. Tech. Rep. WO-67. Washington, DC: U.S., Department of Agriculture Forest Service, Ecosystem Management Coordination Staff. 305 pp. Comer, P., D. Faber-Langendoen, R. Evans, S. Gawler, C. Josse, G. Kittel, S. Menard, M. Pyne, M. Reid, K. Schulz, K. Snow, and J. Teague. 2003. Ecological Systems of the United States: A Working Classification of U.S. Terrestrial Systems. NatureServe, Arlington, VA. 75 p.
Eyre, F. H. E. 1980. Forest cover types of the United States and Canada. Society of American Foresters, Washington DC., USA. Grossman, D. H., D. Faber-Langendoen, A.S. Weakley, M. Anderson, P. Bourgeron, R. Crawford, K. Goodin, S. Landaal, K. Metzler, K. Patterson, M. Pyne, M. Reid, and L. Sneddon. 1998. International classification of ecological communities: Terrestrial vegetation of the United States Volume I. The National Vegetation Classification System: development, status, and applications. The Nature Conservancy, Arlington VA., USA. Shiflet, T. N. E. 1994. Rangeland cover types of the United States. Denver, CO, USA: Society of Range Management. 151 p.
Q Does the sensor problem with Landsat 7 affect LANDFIRE mapping? LANDFIRE vegetation and fuel mapping relied on circa-2001 Landsat imagery. The Landsat scan line corrector problem occurred in late 2003, after the acquisition of all imagery used in LANDFIRE National (LF c2001). Landsat 7 SLC-off imagery were used for MTBS fire mapping and MTBS data was included in LF 2008, LF 2010, and LF 2012. Landsat 7 SLC-off imagery has scan line issues. For LF 2012, these issues were addressed, however, they were not corrected in LF 2008 and LF 2010. To reduce the impact of the scan line artifacts in LF 2012 data products caused by gaps in MTBS data, a combination of modeling and image processing techniques were applied. Decision-tree modeling was implemented when appropriate image data were available. A majority focal filling raster image processing technique with a 12 x 12 filter was used when suitable imagery was unavailable. The disturbance legend was modified to account for the additional processing methods so users can identify the source for each disturbed pixel. Q Why is mapping existing vegetation necessary? Layers of existing vegetation type (EVT) and structure are used in LANDFIRE's modeling and mapping of wildland fuel, fire regimes, and ecosystem status. Further, LANDFIRE vegetation products characterize existing vegetation composition and structure and thus prove useful in various land management applications. Q What is potential vegetation (PV) and what time periods do the potential vegetation layers represent? Q Is VCC the same as FRCC? Vegetation Condition Class (VCC) and Vegetation Departure (VDEP) are the same data that was previously called Fire Regime Condition Class (FRCC) and Fire Regime Departure Index (DEP). According to the FRCC Guidebook, FRCC is a combination of vegetation departure and fire frequency and severity departure. The layers previously referred to as Fire Regime Condition Class (FRCC) and Fire Regime Departure Index (DEP) were measures of vegetation departure, hence the name change. Q How are reference conditions generated? Reference conditions for LF 2001 and LF 2008 used the Vegetation Dynamics Development Tool (VDDT). Reference conditions for LF c2001 were generated using LANDSUM. Q What summary units are used in VCC? Summary units for LF 2001 and LF 2008 used hydrologic unit codes (HUCs 8, 10, 12) depending on the fire regime group. Summary units for LF c2001 used ECOMAP subsections and map zones. Q Why did the layer name change from FRCC to VCC? According to the FRCC Guidebook, FRCC is a combination of vegetation departure and fire frequency and severity departure. The layers previously referred to as Fire Regime Condition Class (FRCC) and Fire Regime Departure Index (DEP) were measures of vegetation departure, hence the name change. Q Why do the forest canopy maps have values of zero in some places? Canopy characteristics refer only to the canopy of trees. Where there are tree canopies (in other words, existing vegetation types that are forest or woodland), LANDFIRE has attributed the grid with canopy characteristics. However, there will be no canopy characteristics in fuel types where the tree canopy is considered a part of the surface fuel and the surface fire behavior fuel model is chosen as such. This is because LANDFIRE assumes the potential burnable biomass in the tree canopy has been accounted for in the surface fuel model parameters. For example, young or short conifer stands where the trees are represented by a shrub type fuel model will not be attributed with canopy characteristics. These maps were developed for use in the FARSITE and FlamMap fire behavior applications (visit http://farsite.org/ for more information on these applications). Q In what units are LANDFIRE Canopy Base Height (CBH) and Canopy Bulk Density (CBD) measured? Canopy base height is measured in units of meters * 10. Thus, a value of 5 on the CBH grid layer is actually 0.5 meters. Canopy Bulk Density is measured in units of Kg m-3 * 100. Thus, a value of 6 on the CBD grid layer is actually 0.06 Kg m-3. The multipliers augment the raw units to facilitate implantation in FARSITE and FlamMap. Full descriptions of the CBH and CBD products can be found in the Data Products: National section of this website. Q Why are there odd lines in the canopy fuel data? Note that these lines exist in the Existing Vegetation Type layer as well. These lines result form radiometric oddities in the satellite imagery used to create these layers. This phenomenon generally occurs on the seam where two satellite overpasses from different dates were mosaicked to produce a seamless coverage of each zone. Since satellite imagery serves as a predictor of canopy base height (CBH) and canopy bulk density (CBD), the lines are "stamped" onto the resulting CBH and CBD layers. Q Why are all hardwood existing vegetation types coded with a canopy base height of 10 meters (raster value of 100 meters * 10)? Most fire behavior analysts prefer not to simulate canopy fire in hardwood systems. In short, most stands of deciduous trees (such as Populus spp.) do not burn in the canopy unless there are significant ladder fuels underneath. Q How is canopy base height and canopy bulk density calculated in LANDFIRE? Canopy base height (CBH) and canopy bulk density (CBD) are calculated using the program FuelCalc designed by Elizabeth Reinhardt of the Missoula Fire Sciences Laboratory. This program ingests plot data — including species, diameter at breast height (DBH), height, height to live crown, canopy cover, and trees per acre — and computes CBD using species-specific allometric relationships. CBH is assumed to equal the height at which CBD becomes 0.012 Kg m-3. Full descriptions of the CBH and CBD products can be found in the Data Products: National section of this website. Q How are the LANDFIRE fire behavior fuel model maps created? Q How do rule changes affect neighboring zones? Rules must be nationally consistent; therefore, if one rule for one existing vegetation type (EVT) is changed, then the change affects that EVT in all zones. However, some types behave distinctly differently due to local variation, and this information would be reflected in the resultant map. This type of local variability is determined through expert opinions garnered from LANDFIRE calibration workshops. Q Why aren't there slash models (FBFMs 11, 12, 13) in regions with abundant slash? Slash is not practically detectable using the 30-m resolution Landsat satellite imagery, especially where overstory is present. We therefore do not employ the slash models except in rare instances where local experts determine that the slash models give the best representation of the expected fire behavior. For example, slash models best represent areas of very thick blow-down where fuel loads exceed those depicted in FBFM10. Q What version of ArcGIS is LFDAT compatible with? Refer to LANDFIRE Tools and User Documents to determine LFDAT compatibility. System prerequisites for LFDAT are listed on page 2 of the User Guide. Q Do I need to uninstall LFDAT prior to upgrading ArcGIS? Yes. See page 2 of the LFDAT User Guide for instructions. Q How do I download LFDAT on my computer from Internet Explorer (I.E.)? Assure you are logged on as a system administrator, right click on the Internet Explorer (I.E.) icon and select Properties (or open I.E. and select Tools | Internet Options). Select the security tab in the internet properties window. Select trusted site on the security panel. Verify the security level for this zone is set to medium, change it to medium if not already set. Click the sites button in the security panel. Uncheck the box to require server verification (https) for all sites in the zone. 7. Type http://landfire.cr.usgs.gov in the add this website to the zone text box. Click add. Click the customer level button. Scroll down to the downloads section, enable for automatic prompting for the fire downloads. Click yes in the warning window. Click ok in the internet options window to close. Q How do I install LFDAT for my new version of ArcGIS? Q What do I do if I get the error code 1001 when I uninstall LFDAT v2.2, v2.3, v.2.4, or v.2.5? Error 1001. Unable to get installer types in the C:\ProgramFiles\NIFTT\LANDFIRE Data Access Tool\lib\LF_DataToolbar_2X.dll assembly. Unable to load one or more of the requested types. This error occurs when the Microsoft.Net Framework and/or the ESRI.NET libraries are not installed. Make sure the .NET Framework runtime 2.0 or later is installed. Then confirm the ESRI.NET components are installed. 1. Assure you have logged in with administrative privileges. 3. Uninstall LFDAT through the control panel, do not manually delete files. Q What if I uninstall my older version of ArcGIS prior to uninstalling the LFDAT tool? Q Where is the LFDAT tool located in ArcMap after I install it? Sometimes the LFDAT tool does not automatically appear in ArcMap. You may need to open the Customize menu, click Toolbars and select LFDAT. Q I received an error message when attempting to download LFDAT. An error occurred attempting to install LANDFIRE Data Access Tool Details << Unable to locate application file "LFDAT"_installer.msi. Instead of clicking the "setup.exe" file, click the "LFDAT_Installer.msi" file. Q How can I access the LFDAT tool when I'm running ArcGIS through a CITRIX platform? LFDAT is not available in ArcGIS when you log on through the NRM platform. You must log on through the GIS pathway and this will allow you access to LFDAT. Q Can I use the Smart Assembler tool for the data I downloaded on the LANDFIRE Data Distribution Site? -Make sure you are downloading the zipped data into a new empty folder (e.g. "EVT_in") and that you are extracting the data into a new folder (e.g. "EVT_out"). -Click the LFDAT paper clip icon to find out if you need any updates. -Confirm the directory the files are downloading to is a writeable location (e.g. the c: drve). If it is a writeable directory, try shortening the file path and name (e.g. c:\data). Q What does the Smart Assembler tool do? The Smart Assembler unzips and mosaics LANDFIRE data. There is also an option to reproject your data. In regards to LCP files, the Smart Assembler only unzips them. Q Can I download multiple raster pieces at one time with LFDAT? Q When I try to download LANDFIRE my screen gets stuck on Extracting data for several hours... ? Sometimes the LANDFIRE Data Distribution Site may be slow or unresponsive for short periods of time. Q Can I reproject data using LFDAT? Yes, LFDAT provides an option to reproject the layers during the automated processing in the Smart Assembler, but users will need to understand the implications of reprojection. Users need to specify reprojection parameters. Q Do I have access to the most recent LANDFIRE data using older version of LFDAT? No, users need to download the most recent version of LFDAT to access current data. Confirm you have the most current LFDAT version at LANDFIRE Tools and User Documents. Q I installed LFDAT 2.x on Windows 7 or 10 and I am getting an error message in the "Check for Updates" option and the download option does not work. What can I do to fix it? For "Check for Updates", you can get any of these error messages: (1) Component `MSCOMCTL.OCX` or one of its dependencies not correctly registered: a files is missing or invalid; or (2) Out of Memory. Also, from the download option, after drawing a rectangle in the area of interest, nothing happens. These two problems occur because LFDAT requires an ActiveX control for Visual Basic 6 (MSCOMCTL.OCX) on Windows 7 and 10. If the file exists, go to step 5. If it does not exist, download the OCX file to your desktop or someplace you can find it. If the file downloads as a .txt file, rename file from extension *.txt to *.ocx. For Windows, upper and lower case letters do not matter when working in the Command Prompt window. You should see a message like this: DllRegisterServer in MSCOMCTL.OCX succeeded.